Even the two smallest sizes provide sufficient detail to be able to distinguish between books and to find them in the iPad. Hanging the posters vertically so it appears as if the books are stacked one on top of the other doesn’t present a problem – in fact it makes it easier to read the book titles; however it might be better to remove the edge of the shelf running vertically down the poster and perhaps replacing it with a shelf at the bottom of the stack. As with ordinary books, its more convenient to view the bookshelf posters at head height; and it’s interesting to anticipate that a system displaying digital versions of the posters would enable shelves to be switched to the preferred height at will. Like the posters, digital versions of the bookshelves could be duplicated and displayed in other rooms or locations. The second biggest size posters have become my permanent visible images of the books I have scanned and which I no longer have physical copies of. They are arranged in a 40 x 30 in IKEA RIBBA frame which is on my study wall directly ahead of me as I sit at my desk. 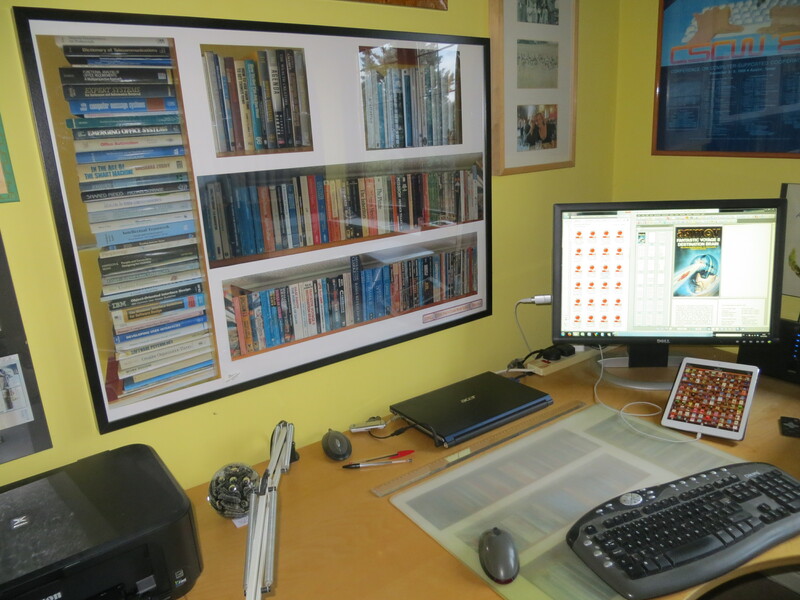 Being able to use the smaller-than-full-size posters has made it much more feasible to do this – the full size posters would have taken up too much of the wall space. I now have a much more constantly visible view of the spines than I ever had before when they were on bookshelves behind my desk amongst a lot of other material. The third biggest size posters have now been arranged on a sheet of white paper and placed underneath the plastic desk pad on which my keyboard and mouse sit and on which I write longhand on occasion. This provides an unobtrusive decoration and demonstrates the reproducibility of the electronic bookshelf. The picture below shows the framed electronic bookshelf posters, the version under the desk mat, the book PDF files and an opened file on the adjacent computer screen, and the iPad showing thumbnails of the same PDF files. 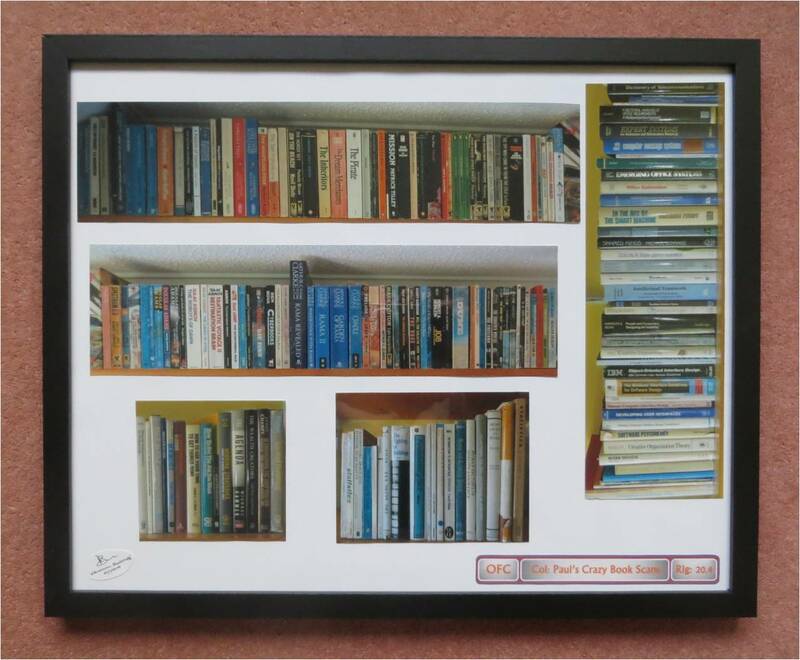 The smallest size posters have been arranged in a 20 x 16in Wilko frame (see below) and given to my son and his wife as a housewarming present for the library area of their new house (not sure how much they will enjoy this but it had to go somewhere…!). The largest, full size posters have been stored at the back of a large picture frame that I have in my study (see Poster Management journey) in case I should want to use them in future. There is undoubtedly some synergy between some of the points that have emerged from this electronic bookshelf exercise and in the way that mementos might be displayed, and I intend to think about these when I start the next phase of the Memento Management work described elsewhere in this site. In the meantime, however, my current exploration of the Electronic Bookshelf has come to an end. Perhaps when electronic paper becomes sufficiently cheap, and when an App is available to create, manipulate and arrange the images of book spines and covers, I’ll attempt to replace my framed poster version with the real thing.